I hear about the viper-mode and vimpulse stuff a lot, and while they go a long way towards helping emacs be more useful for text editing, I find the discontinuities disturbing. For example, I am no longer in vi-mode if I end up in a help window of some sort. I cannot just Ctrl-W+Ctrl-W my way back to the original window; that suddenly deletes words. But I like working with multiple windows in vim sometimes. This gets frustrating for a vim user. Also, macros are still not fixed, still using the emacs assumption of what people want for an enhanced vi. We want the easy qq and @q. Definitely, if you are going to try it out, grab vimpulse. viper-mode is a joke to the developers coming from the vim world. vimpulse makes visual mode highlighting sensible. viper is not for vim users, it's for Emacs users. As a long time Emacs user who doesn't really enjoy holding down the control key while editing text, viper is wonderful -- it gives Emacs a command mode, without making Emacs work like vi. If I wanted vi, I would just use vi. That's the logic behind Viper, anyway. I believe a few people are working on a vim emulation layer for Emacs; giving Vim users the ability to have a proper scriptable environment, without having to give up anything they know from Vim. Ask on #emacs. Heh, I've ended up doing the same thing. The issue is that Vim's key scheme has a much better economy of motion (faster with less movement) while Emacs is much more extensible and flexible. So this is the compromise instead of creating yet another text editor. I hear a lot about this vim vs emacs war. But I have never seen a battle, so to speak. Where can I see videos of people actually using this text editors? A side by side comparison of interesting/useful features? I really would like to choose, but the most I managed to find was a guy playing snake on his emacs. I'm currently using the very basics features of vim, but just because I felt like it and it came with a tutor file. Have you checked out the VIMCasts (http://vimcasts.org/) series? They're pretty great. I don't know of an equivalent series for Emacs. I'm a VIM-ophile, but I find ELisp to be a major draw for Emacs. I think if I could entirely swap out the movement features of Emacs for those of VIM completely, I'd switch tomorrow. That said, Viper and Vimpulse just don't cut it. All the really matters is that you use what you like. If you like gedit or notepad++ that's just fine. FYI, emacs also comes with an extensive tutorial. Personally, I used emacs and clones (mg and JASSPA MicroEmacs) for a long time- though I never really went very deep into the features. Then, I started a job where I'd be doing some sysadmin work on AIX boxes- nothing but vi and ed installed- so I figured I should sharpen my rusty vi/vim skills. I've found myself using more of the features available in VIM, as well as writing plugins myself. After you get past the initial weirdness (for folks coming from emacs and other modeless editors) I've found it easier. Less of a learning/feature curve, far fewer keystrokes, and almost no "Meta-Shift-Control-Z Ctrl-X abc" acrobatics. UI feels more modular in that I'm stringing together simple commands rather than using a command that does something specific. The problem with the "use what you like" approach is that the emacs/vim learning curve are too steep. By the time I am actually using one of them I'll have spent so much that the fear of change starts to strike and I'm stuck with that editor. Vim is cool because it's built in to every OS (except maybe Windows) and highly usable even without any configuration and requires very little resources. For me knowing vim has proven a very productive skill. I often work on random new OS installations like virtual machines and cloud instances, and sometimes in very limited environments like embedded Linux devices. It works there just as well as in my regular Mac/Linux environments. vi is the one built into every OS. Sometimes it happens to be vim, but not always... and other vi variants are quite different from vim. Really? I thought nvi and elvis had fallen by the wayside, and now everyone shipped vim (in compatibility mode). I noticed recent distributions (last couple years) deploy a crippled form of vim, halfway between vi and vim. You still have to "sudo apt-get install vim" to get something that is nice. Slackware comes with /usr/bin/vi symlinked to /usr/bin/elvis by default, although it's easy enough to point it at /usr/bin/vim if you want. Are they shipping nvi then? I used to do the same thing, but I missed out on a lot of good emacs shortcuts. Today I use the dvorak version of Xah Lee's layout. You get vim-like navigation by holding Meta. Somewhat specious, since Emacs can be run inside Vim too. I've tried using Emacs with Caps Lock as Control key, and it didn't worked well. So I changed Ctrl to (1)right-click-menu key (or whatever it's called) and to (2)right Alt; and turned Caps Lock into Alt. Now I can easily move around Emacs without hurting my pinky to much :). Long live Emacs! I like using vim in emacs, but it makes it too easy for me to fall back to my emacs muscle memory. BTW, vim is the perfect editor for tablets and similar devices with a shrunken keyboard. Seriously? Seriously? It's 2010, and we're still having this religious debate? Pick an editor that works for you. Learn it. Use it. Done. NB I'm a heretic, I use both vi and emacs. If it's a religious debate, why is it surprising that people are still having it in 2010? Aren't religious debates known for never getting resolved? Also, aside from the article's title, I don't see the religious debate in the article or the comments. I see people saying how they use vim and/or emacs, and providing tips. I'd like to know how you're using both vi and emacs. I like both, and used both for a while. Please do tell. I use emacs and vi at the same time, too. 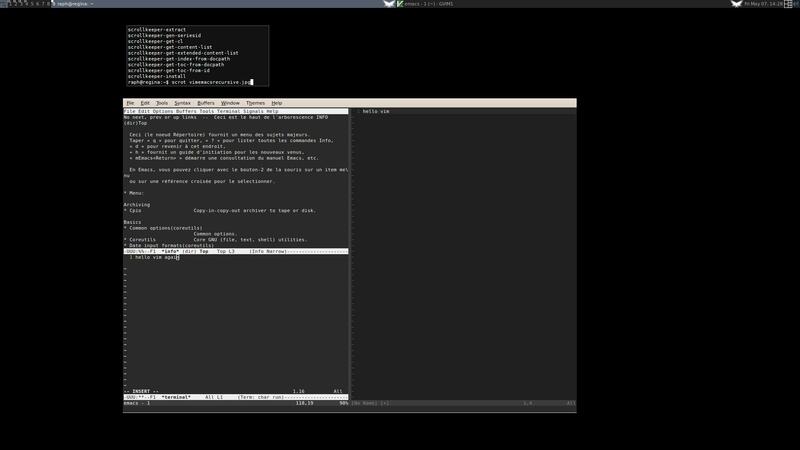 I usually have a two-pane emacs open that takes the whole screen and an 80x22 terminal in the back. When I need to navigate to some config file/log file etc. I use ls/pwd/pushd etc. and use vi from that terminal on whatever short edits I need. I use emacs for the code that I'm writing, the one that's under VCS and everything. As for using both, I tend to use emacs for the heavy lifting, and vi for quick edits. I would consider actually reading the article, since it's not actually about the vim vs. emacs religious war at all.